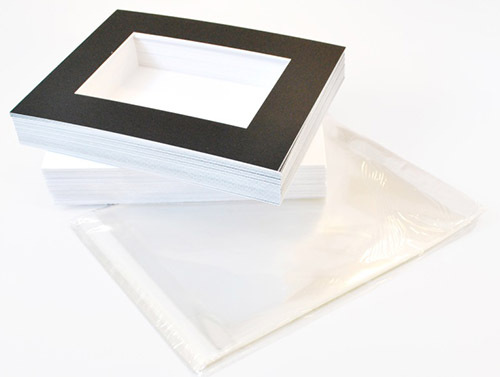 Packs of matboards, economy backing and bags to protect your art work. Show kits are primarily used in art shows to present artwork, see our guide on matboard for art shows for more information. Show kits consist of picture matting, show bags and backing boards. The artwork is placed between the picture mat and backing, and the package is placed in the bag. This ensures that the artwork is safe and protected during travel, and it is an attractive package for customers. The show kits listed here are for quick purchasing in quantity. They consist of economy backing, and come in standard sizes and colors. You can customize your kit with our custom matting page. It allows you to select any quantity, size, color and backing. Pricing is the same so you will get the best possible deal regardless of how you purchase.